On Thursday, September 14 we hosted our monthly How Do I…? demonstration. 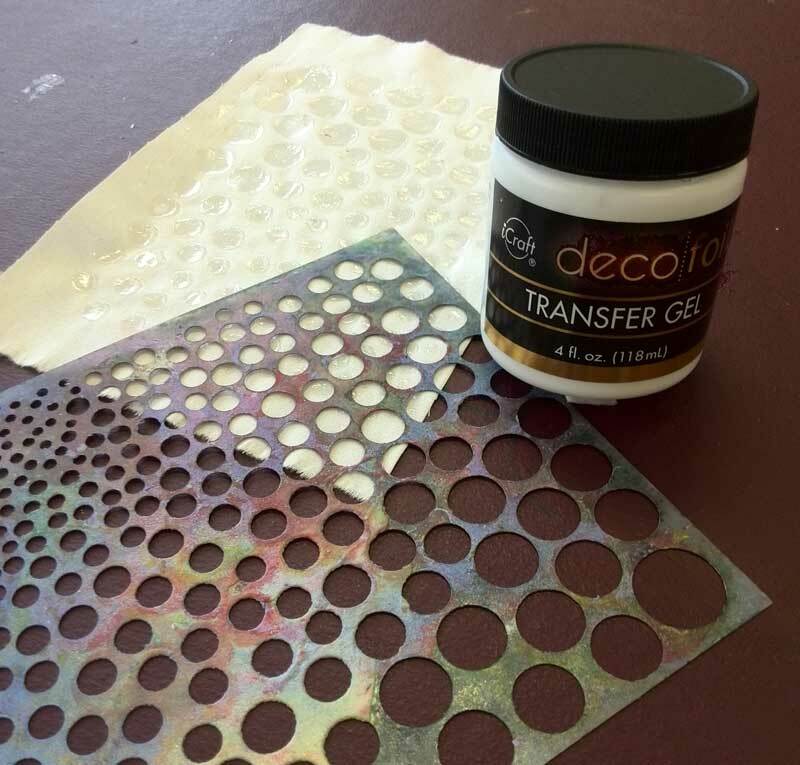 The topic was foiling fabric and paper, and we used iCraft Deco Foil Transfer Sheets Value Pack in Rainbow and iCraft Deco Foil Transfer Gel (jar pictured above), which is an acid-free, permanent foil transfer gel made for use with paper and cardstock. 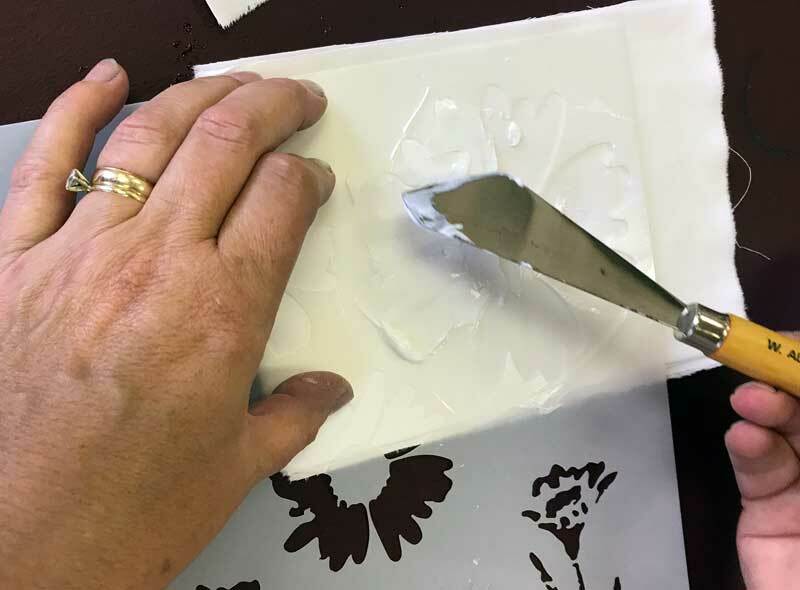 We also experimented with using the adhesive on fabric… because that’s just how we roll here at Artistic Artifacts! Our first experiments (below) weren’t up to snuff. 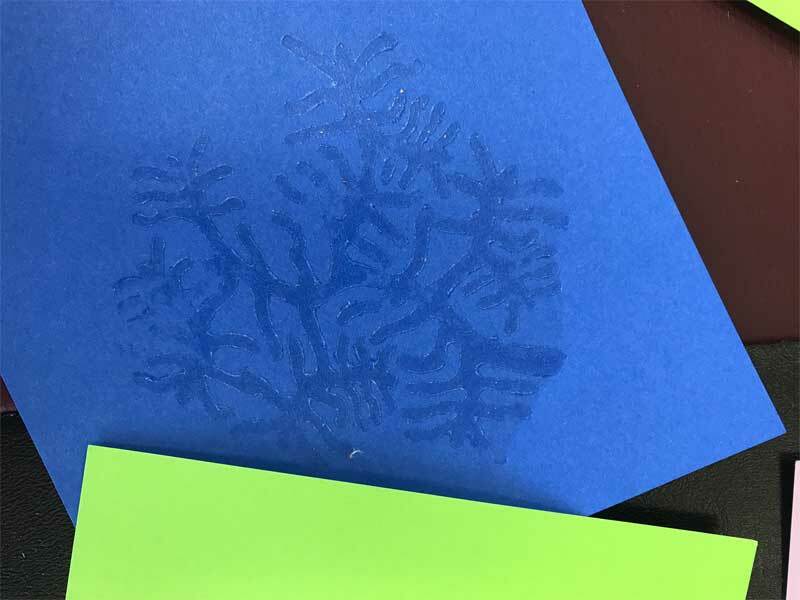 We wanted to experiment with using our wooden printing blocks to stamp the adhesive, but we learned we were not applying the transfer gel thickly enough. (Yes, we often learn as much as our students!) 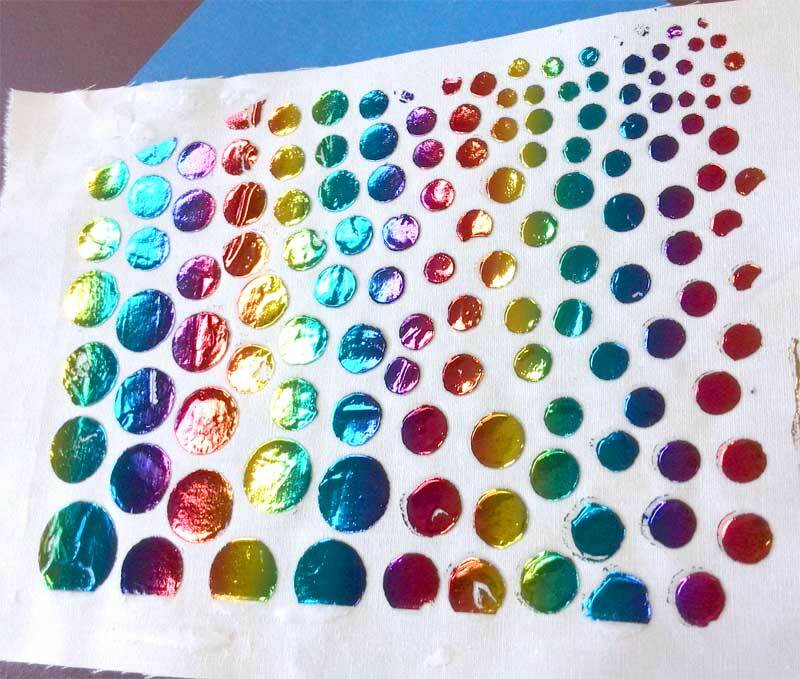 Because it requires a minimum of an hour to dry — you cannot apply the foil to wet adhesive — we were preparing some swatches for our attendees to use in advance. The extremely faint print left above resulted from not just too little adhesive, but by running it through the laminating machine (our chosen method for the heat and pressure needed to transfer the foil from the carrier sheet to the prepared surface) sandwiched between two sheets of cardstock. The swatch on the right was put through the laminator sandwiched between two sheets of copier paper, which made a big difference even with the too-thin adhesive. Our instincts were to apply the transfer gel thinly and we were spreading it as we would paint. Once we realized we needed a thicker layer, our results were strong. 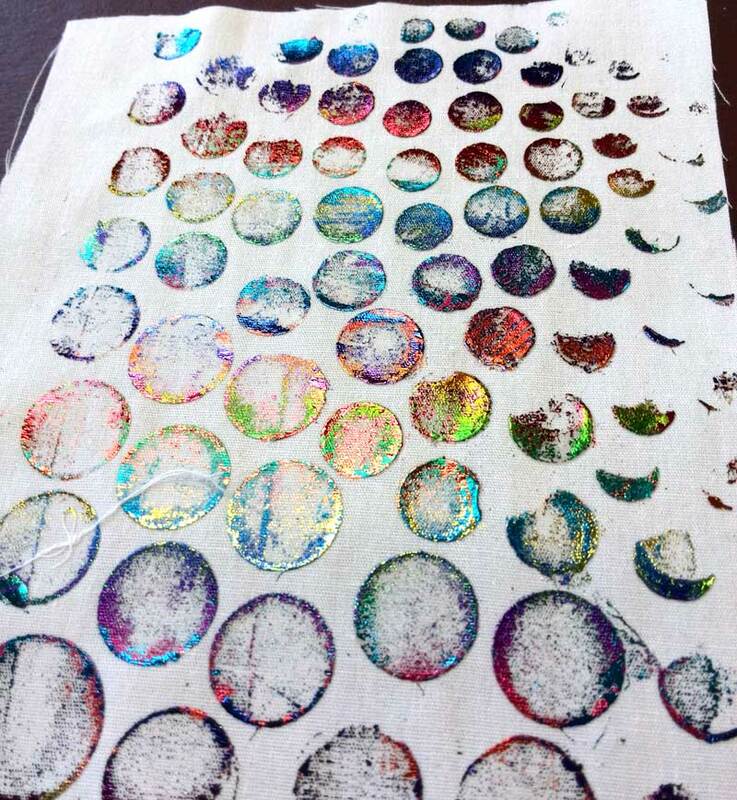 Above, using a palette knife to apply the gel through a stencil onto a cotton fabric swatch. Above left, freshly applied transfer gel, which appears as a thick white paste. Right, the transfer gel properly dried — it is clear and shiny, with a slightly tacky feel/finish. 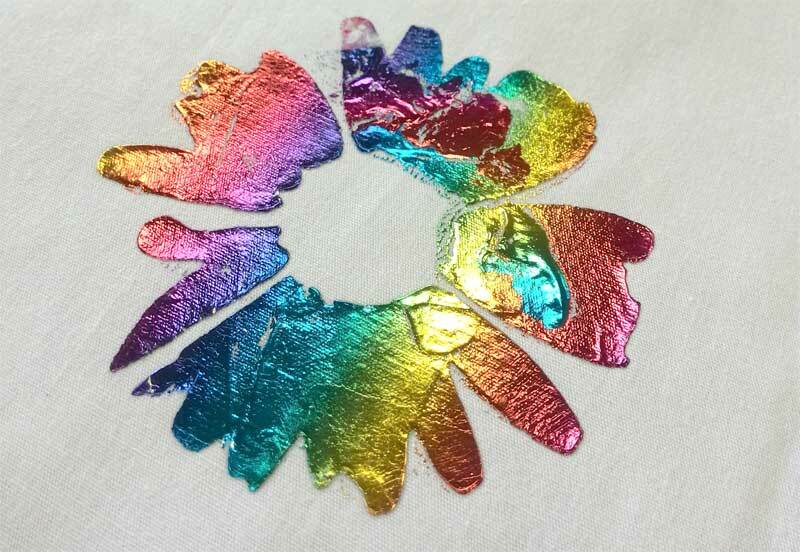 Above and below, after the rainbow foil is applied. The flower above did end up with two small patches of white where the foil didn’t apply, whether from it being too thin, or the surrounding gel being mounded higher preventing it from contact with the heat and pressure. We reapplied gel to the bare areas, and once dry ran it through the laminator again. We didn’t try matching the colors up in placement, giving us a cool effect of a bit of aqua on red, etc. 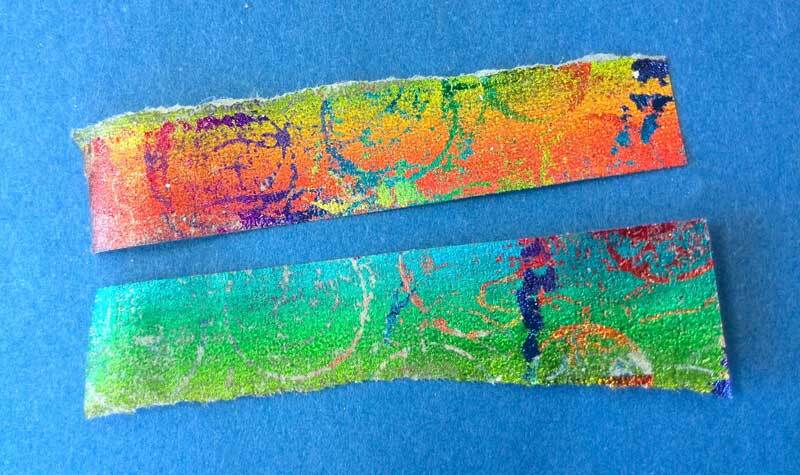 The foil will act as a resist, so we can apply paints or inks to this swatch to color it further. Gorgeous as is, and a fun starting point for further experimentation. 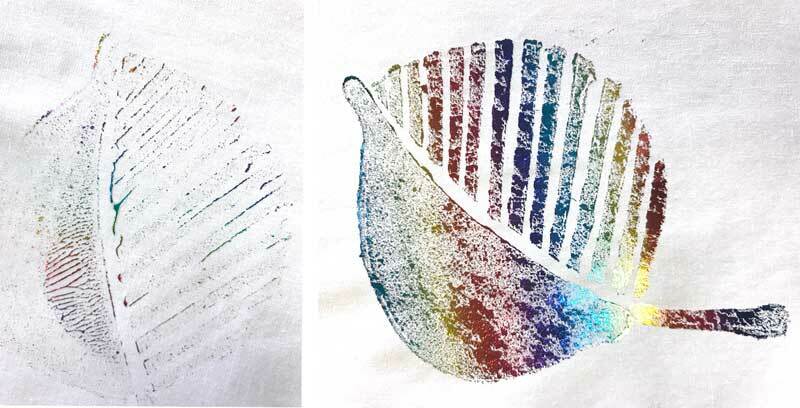 You can see the adhesived dried on the paper swatch above, a print from our WB226 Tree Coral Wood Block. Below you can see the texture that resulted. 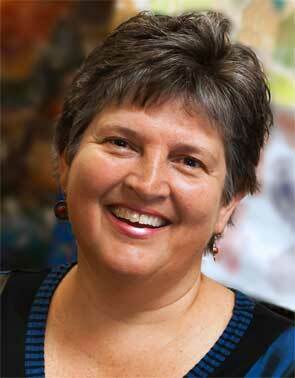 We also used Mistyfuse Sheer Paperless Fusible. Below is a swatch example; we get so involved during the actual evening we forget to take photos. One of our attendees created a gorgeous abstract starburst cutting triangles of Mistyfuse and foiling it. Wish we could share that! When you foil, make sure the color side is up/facing you, and the more matte silvery side is down against your surface. It can feel counter-intuitive… and FYI, even when you KNOW this rule, you can make the mistake! 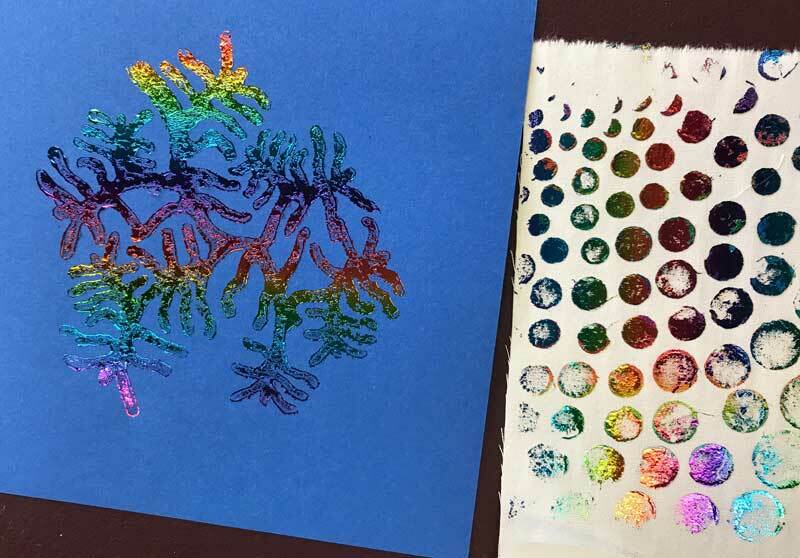 You can see the silver/matte side of the foil in the photo above, in between our Tree Coral block on the left and the unused piece of foil on the right. 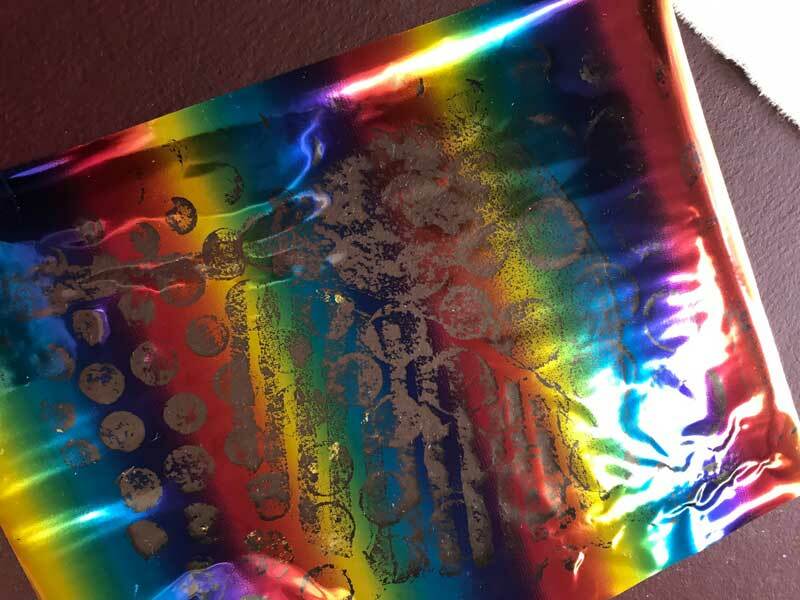 Note that the flower image bottom right was intentionally foiled with a sheet that had already impressed a bubble print… again, we really like what others might see as a mistake! Above, a partially used sheet of foil… you can see the burgundy worksurface through the sheet where the foil has lifted off the clear plastic carrier sheet. Don’t throw partially used sheets out, as until the sheet is completely clear, there is usable foil there. 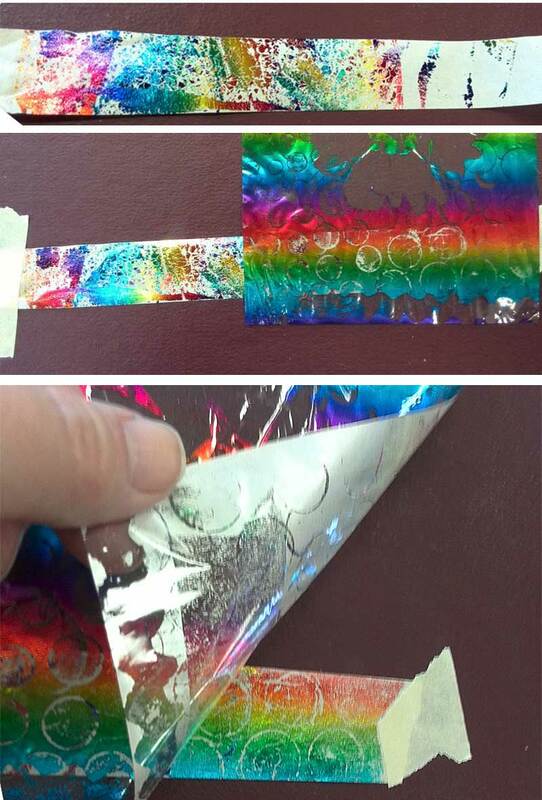 These used sheets were the supply for another easy way to use the foil — creating our own metallic washi tape. We used ordinary masking tape and burnished (even finger pressure works for this) the used sheets of foil randomly across the sticky surface. Below, a completed length. We love breaking up the rainbow stripes into these random splashes of color! 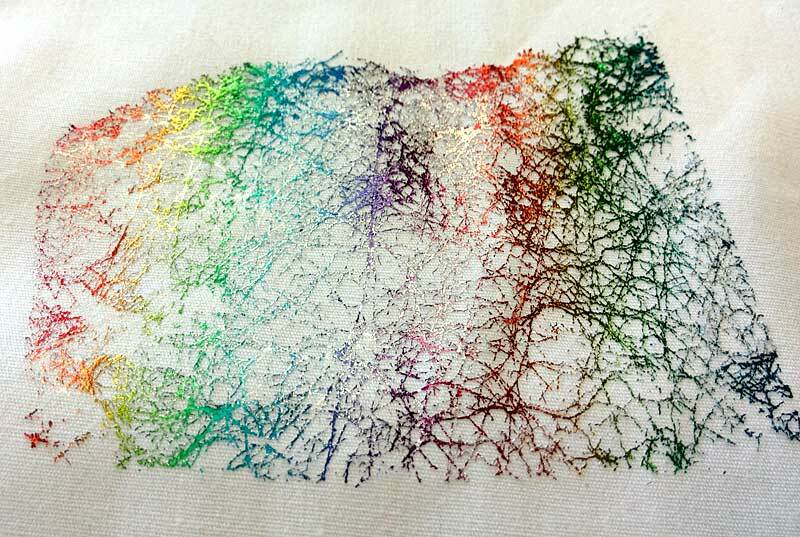 You could also apply the foil more sparingly, and use mica powders, pigments, or embossing powder on the exposed areas of the masking tape to eliminate the stickiness and add even more color and texture. Below, the masking tape easily tears for a more organic edge if desired. 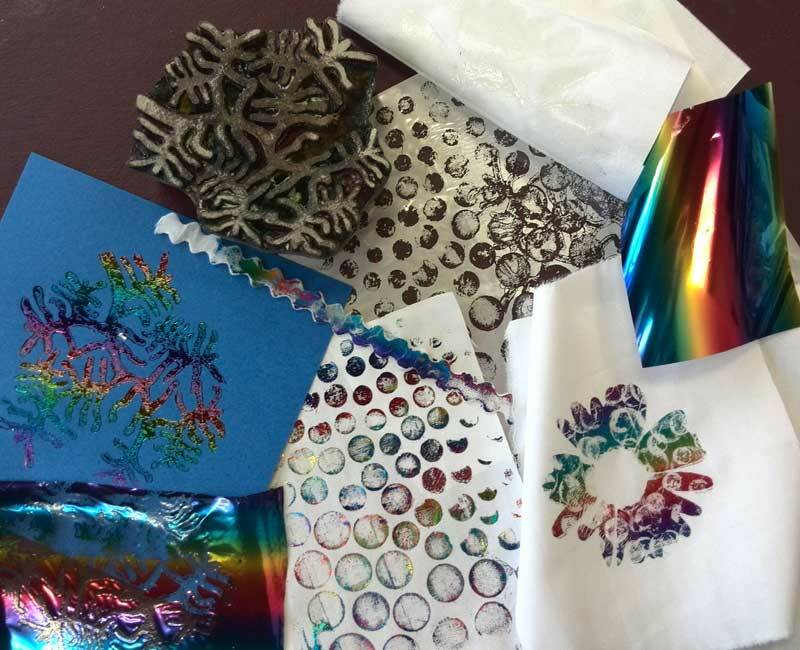 There are plenty of tutorials out there for foiling, but as always, we encourage you to experiment and approach the process with a “what if?” attitude. Have fun!